If bakkies are so popular, why hasn’t anyone built a battery-powered one? The world’s best-selling vehicle is a bakkie: the Ford F-150. South Africa’s best-selling vehicle is also a bakkie: the Toyota Hilux. Despite the surging popularity of bakkies, there is not a single battery-powered pick-up or double cab on sale. At a time when nearly all automotive brands are rushing battery-powered electric vehicles to the market in some form or another, why is there a complete void of plug-in double cabs? One cannot have a sensible discussion on anything related to electric vehicles without mentioning American automotive disruptor in chief, Tesla. Elon Musk’s controversial car company has managed to produce battery-driven sportscars, SUVs and even a sedan. It has offered a plug-in power alternative to all the segments dominated by German brands, which are the most powerful car companies around. Tesla makes an array of electric vehicles, but no bakkies. Tesla doesn’t have a bakkie, at least not yet. You would think that a bakkie would have been Tesla’s priority, seeing as the United States is its most important market and bakkies are the vehicle of choice for most Americans. Yet Tesla has only teased concept sketches of a bakkie, instead of committing to building one. The reasons for Tesla’s resistance to building a battery-powered double-cab is strategically the same for any brand. Those consumers who are voluntarily becoming early adopters for the electric vehicle revolution mostly live in cities, and have very predictable driving patterns, across excellent road networks – with a high frequency of recharging points. 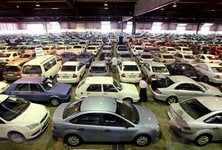 Most bakkie drivers work their vehicles much harder than average commuters. 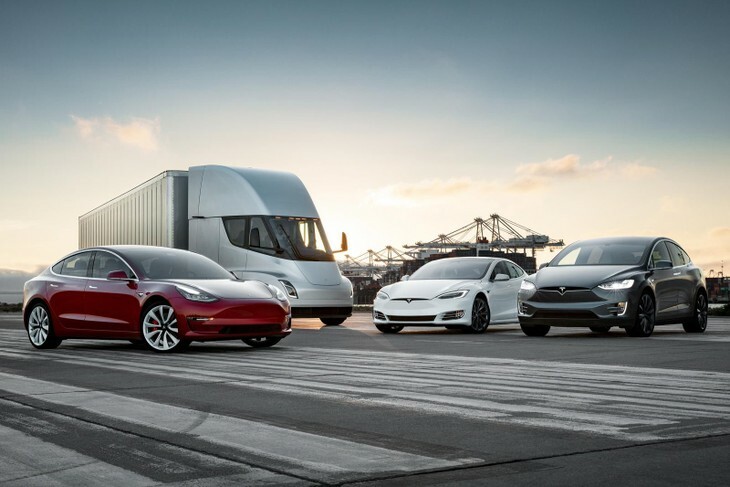 They load them, tow with them and drive them to isolated locations, where charging infrastructure doesn’t exist. Adding load to any vehicle necessitates it to use more energy. Electric vehicles already engender range anxiety and if you are going to load 1 tonne to your battery-powered bakkie, or tow 3 tonnes, chances are that the range reduction will be significant. Rivian is a company pioneering the electric-powered bakkie. In February of this year, a blizzard swept over the northern region of the United States. Temperatures fell to -17° Celsius and those few road users who were piloting electric cars saw their available ranges (from full charges) shrink dramatically, in some cases by nearly 50%. Contrast this with petrol- and diesel-powered vehicles, which retained their normal driving range endurance during the extreme weather. Ranchers and other bakkie users in the north of the US would be left stranded if their vehicles suddenly suffered massive range reductions during bitterly cold weather. 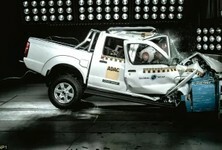 A useful comparison is to think of a local scenario pertaining to bakkie use. South African bakkie owners often plot an adventurous route for off-road driving expeditions into neighbouring countries. Refuelling stops are carefully calculated, and additional diesel is carried along, in jerry cans, as a contingency. With a battery-powered bakkie, if the weather starts to dramatically shorten your range, or you wish to embark on a journey where recharging points are near the limit of our vehicle’s abilities – there is no option to load up extra batteries, as you would with liquid fuel in jerry cans. Theoretically, a battery-powered bakkie offers more space for covered storage and better ride quality. Despite the many arguments against battery-powered bakkies, they are very attractive from a conceptual point of view. 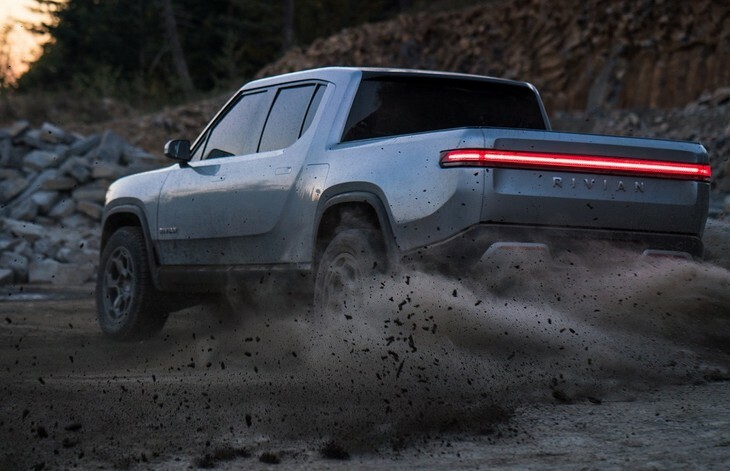 By far the most compelling battery powered double-cab yet produced as a "proof of concept", is the R1T, produced by American company Rivian. Without the need for driveshafts or differentials, this bakkie possesses incredible off-road ability thanks to immense individual wheel articulation and 360 mm of ground clearance. There is no engine in the front, either, which means you can use that cavity as an additional 330-litre lockable stowage area and, with all the bakkie’s mass concentrated in its floorplan, it's likely to exhibit a lot less body roll than its conventionally engined rivals. The Rivian R1T illustrates that a battery-powered double-cab can have tremendous capability and "loadability", but who will be the first mainstream company to bring one to market? 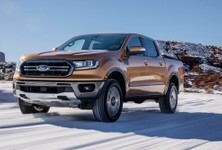 Ford builds the world’s most popular bakkie, but it lacks EV drivetrain technology. The Blue Oval has signed a cooperation agreement with VW to effectively develop the next generation Ranger and Amarok bakkies together, which could mean access to VW’s growing battery-drive resources. Not many charging stations in sight here. Mercedes-Benz is also forging ahead with an array of ambitious battery vehicles. The Sindelfingen-based firm could possibly release powertrain technologies that might come to power future versions of the X-Class. Toyota? Don’t expect a battery-powered Hilux on local roads soon. The Japanese brand has built its renowned bakkie business by being perfectly intuitive to customer needs, instead of following trends. It would take a huge uptick in the rollout of battery-powered bakkies to convince Toyota. The only market where its Hilux features strongly and has a high frequency of recharging points is Australia. All other Hilux markets are decidedly liquid-fuel biased for the time being – including our own. Bakkies from the People’s Republic have not had as big an impact on South African new vehicle sales figures as their importers would have liked, but one would be greatly ignorant to underestimate the Chinese automotive industry and its ability to learn and adapt. 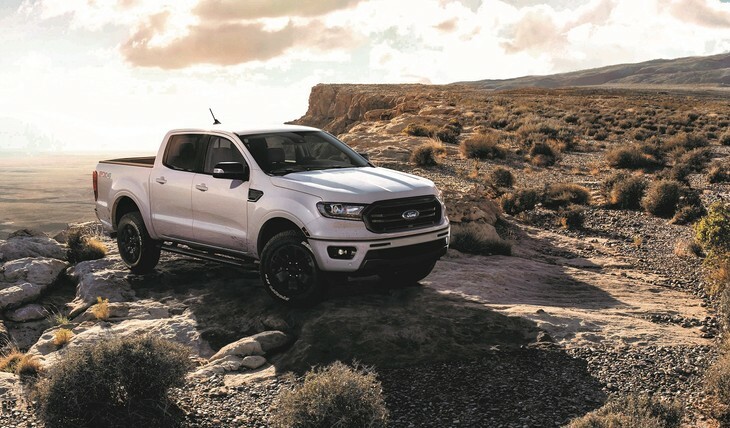 With the current trade impasse between America and China, there is little incentive to build large F-150 sized vehicles that cater to the world’s most popular bakkie market – but that’s potentially very good news for the rest of us. Especially South Africa, a market where the majority of bakkies are categorised as medium-sized pick-ups, the exact classification of vehicle that GWM builds. GWM’s Steed range has been one of the very few credible Chinese bakkie offerings and the brand has just revealed its new 4x4 pickup double-cab. It’s an impressive bakkie with 3 differential locks, not to mention a thoroughly-modern design. 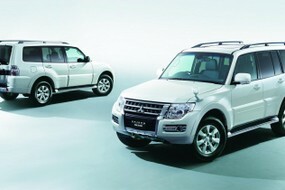 Clearly, GWM is aiming to conquer Ranger and Hilux customers with this 4x4 pickup. GWM's new bakkie appears thoroughly modern. 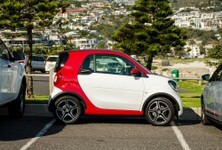 Could it be the first manufacturer to go down the electric route? What is most symbolic about the new GMW bakkie is that China is both the world’s largest market and producer of electric vehicles, raising the probability that the 1st battery-powered bakkie could be Chinese in origin. 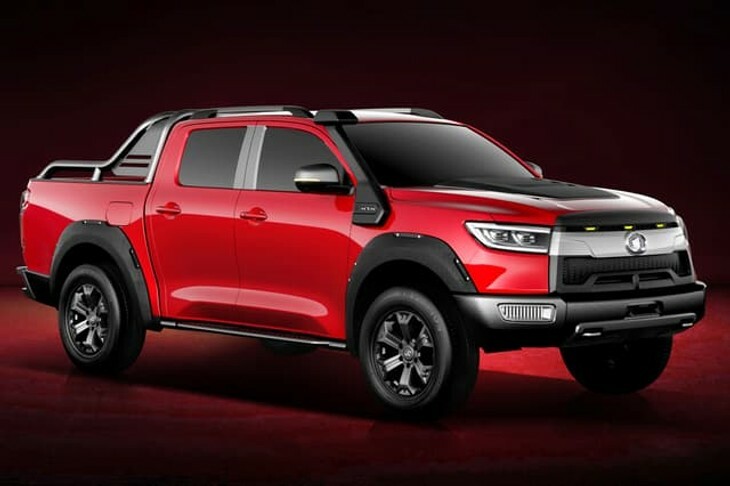 An electrically powered bakkie, with a claimed range of 500 km, is scheduled as the star attraction of GWM’s Shanghai auto show display this month. Battery-powered bakkies have an array of possible advantages over the double-cabs we currently drive. Cabin comfort will be hugely improved, with the annoying transmission tunnel no longer taking up so much interior floor space. The fact that all that room above the front axle, where the engine traditionally resides, can be converted to a secure, weatherproof, storage space – is a great boon too. They should also be inarguably better to drive... Electric vehicles have an incredibly low centre of gravity, making them a great deal more rollover resistant – something which could reduce accident fatalities in bakkies, which routinely cover great distances on SA's gravel roads – at speed! 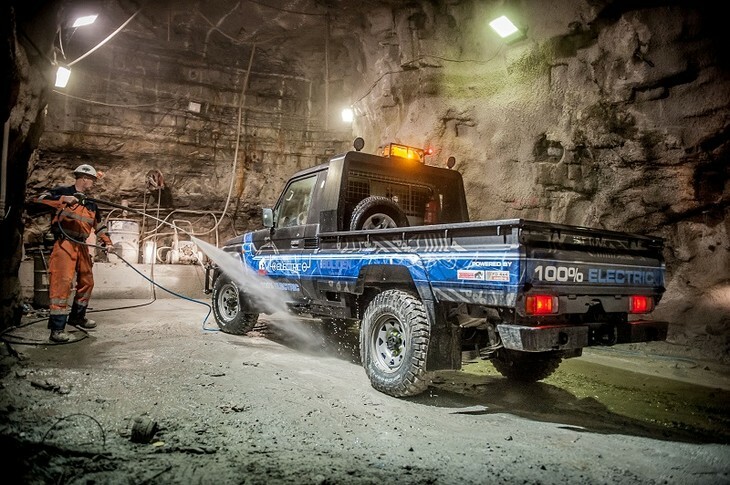 Dutch company Tempo 4x4 does an electric swap-out Land Cruiser. Whichever automotive company brings the first battery-powered bakkie to market – be it Ford, Volkswagen, Mercedes, Rivian or GWM – "e-bakkies" will be held to a higher standard than has been the case with any electric passenger car. Bakkie owners are demanding, their vehicles are an integral part of their livelihood and are expected to perform faultlessly in rough terrain, often many hundreds of kilometres away from support. When the first battery-powered bakkies come to market, early adopters of electric double-cabs will not be wealthy tech entrepreneurs or those who live in lifestyle security estates with off-grid solar power. They will be farmers and ranchers, with solar panels, in the middle of nowhere.